When an application depends on a third party API, you always seem to face similar challenges. Do you integrate against it, even in development? What about the tests, won’t they be flaky if need it to be present for them to run? Meanwhile, if you decide to use stubs, how sure are you that the application is, well, working? I can’t remember how many times I have had perfectly green tests based on mocks that were not testing anything, because the API had changed in some way. Recently I’ve been thinking about this, and I have tried to address this through API recordings. I know this idea from the Ruby world, concretely VCR. 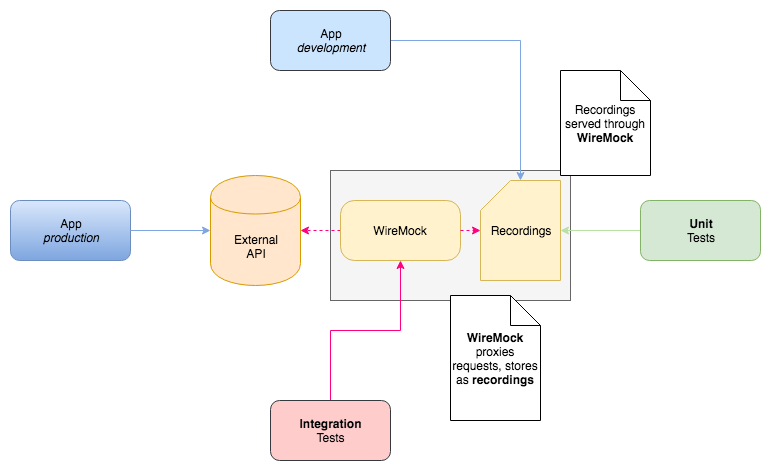 This time, however, I wanted to use it in a Java project, so I looked at WireMock. Following the Testing Pyramid, we want to have most of our tests at the lowest possible level. Unit tests should not be doing network requests. On the other hand, if we use mocks, they should be close to the source, ideally based on actual requests. If we have these mocks already, why not use them for our local development? I want my app to boot app and quickly show something, agian without the need to connect to the outside. And, I want automation. Editing .json files by hand is a recipe for errors and outdated data. I want to avoid friction. Thanks to WireMock, this process is very convenient and almost transparent to the app. A bit of plumbing is required, but it is real easy to do. For the example API, I took this very useful sample API. There are four pieces to take into account in this setup. Inheritance and @Before and @After annotations is perhaps not a best practice, but it makes the tests really succint. Defining additional behavior is easy by just defining extra WireMock rules. This way you can test more specific scenarios like timeouts while keeping most of the regular code quite clean. This class proxies all the requests to the real API, and stores them in the default folder when configured. After that the new recordings are present and ready to be used. This can be done manually or integrated into a pipeline, to make sure that it happens often. The setup contains a bit of magic, but the result is quite simple to use. This way, you can achieve a great testing coverage without compromising the development experience, all while keeping your core unit tests slim and fast. If you have fought with out-of-sync mocks before, you will see the advantage!